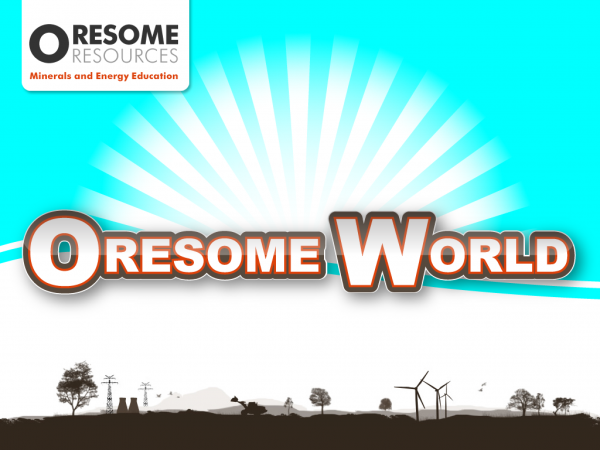 Oresome World is an interactive iPad game that takes the user on a journey of discovery through the Energy and Mining industry. 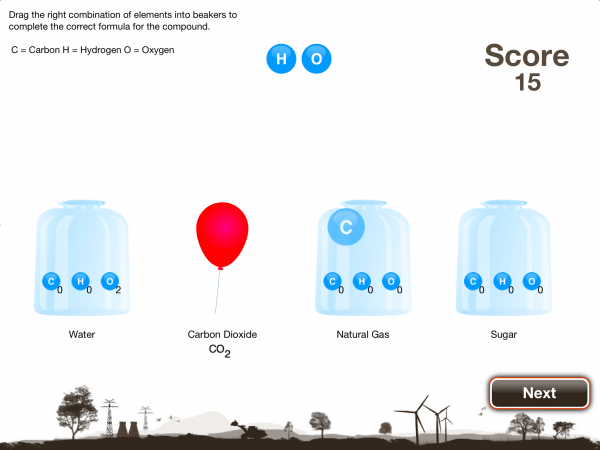 View the media, study the fact sheets and complete the quizzes and challenge activities. Discover what sorts of careers are available in the industry. choosing the correct industry role that matches the site description. From there you can start the quiz to discover just how much you really do know. Each time you repeat a quiz the questions will change. If you get a high score you’ll make it to the ‘Oresome World Leader Board’. 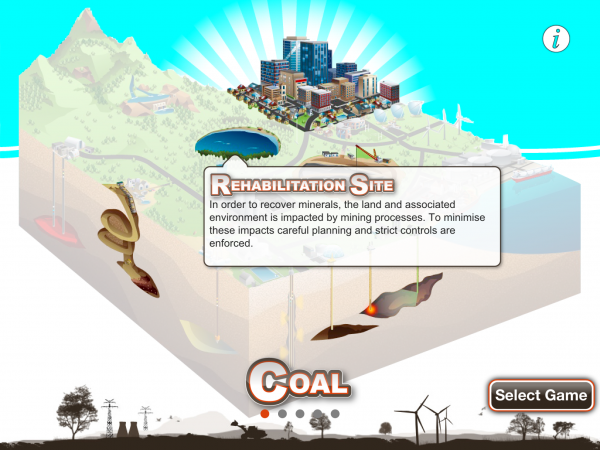 Intunity again partnered with Queensland Resources Council to develop a new and exciting interactive iPad game. Intunity conducted the early concept (including workshops with Educations Services Australia. Mineral Councils of Australia and Queensland University of Technology), design, development, testing and deployment of the App. Oresome World is developed on the back of the success from Oresome Elements which was a Mobile Awards finalist in 2011. 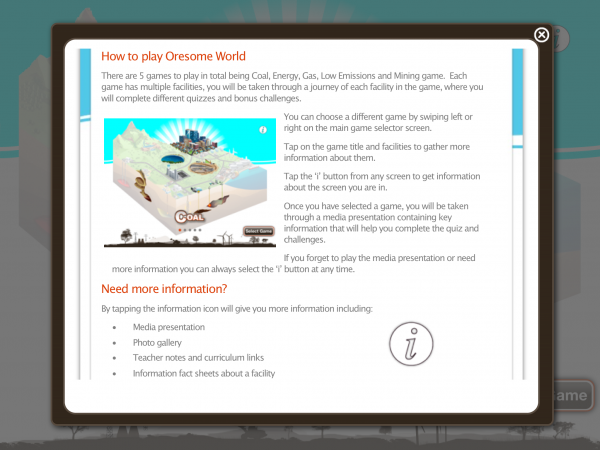 Oresome World is an interactive iPad game that makes learning about the Energy and Mining Industry fun....seriously! 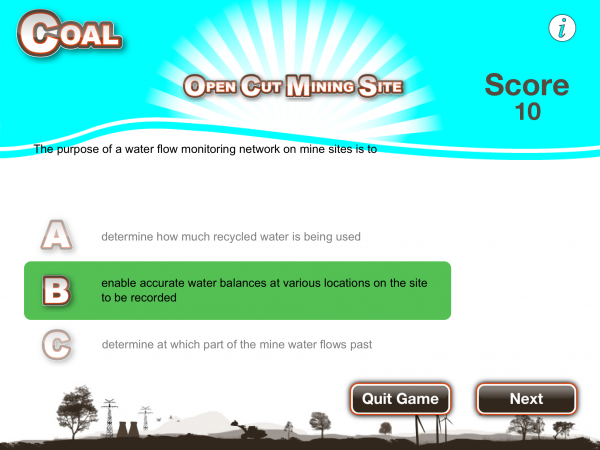 The user can swipe through the Coal, Energy, Gas, Low Emission, or Mining games and embark on a journey of learning and discovery through content and interactive quizzes and bonus challenge activities. No game is ever the same. Oresome World is aimed at secondary school students but is just as much fun for anyone wanting to learn about the Energy and Mining industry, the inner workings of the facilities involved and the careers and roles that make up the Energy and Mining industry. There is a continued push in Australia for technology to be used in the classroom and leverage the investment by education institutions in iPad. The need here is to provide teachers with an app that helps their students to learn in a fun, visual and engaging way. Oresome World fills this brief extremely well. It has rich content and information and could be used in the class room as an activity for students to learn more about the Energy and Mining industry. The innovation of this project is the simple design that allows for quizzes and bonus challenge activity to be delivered as a framework for reuse. In the educational sector there is a large amount of content and assets that have been used to deliver pedagogical value to the student (including media content, Adobe flash and print). Intunity have been able to deliver a flexible interactive framework that allows a simple conversion of this type of content to be available in an iPad game. There is a push in Australia for technology to be used in the classroom and leverage the investment by education institutions in iPad. The user is engaged from the start as they choose one of the games to play. There is five games in total. 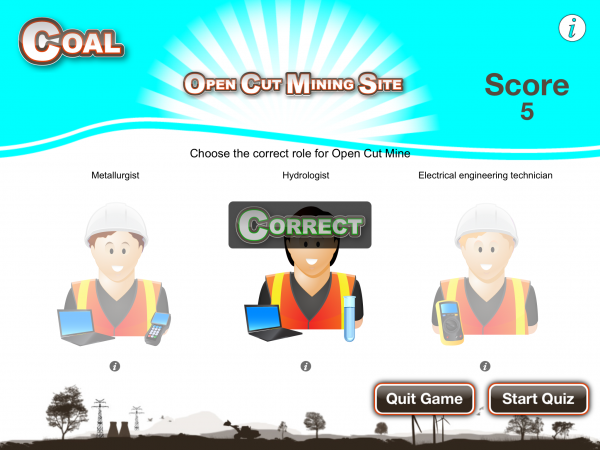 When the user selects to start a game from the Coal, Energy, Gas, Low Emission and Mining games they are taken on a journey of the career roles and facilities involved in each game. The user is presented with media and fact sheets to review. This information is relevant and helps inform the user so that they can complete the interactive quizzes and bonus activity challenges. The aim of the game is to get as many quizzes and bonus activity challenges correct, achieve a high score and enter your name in the leader board. 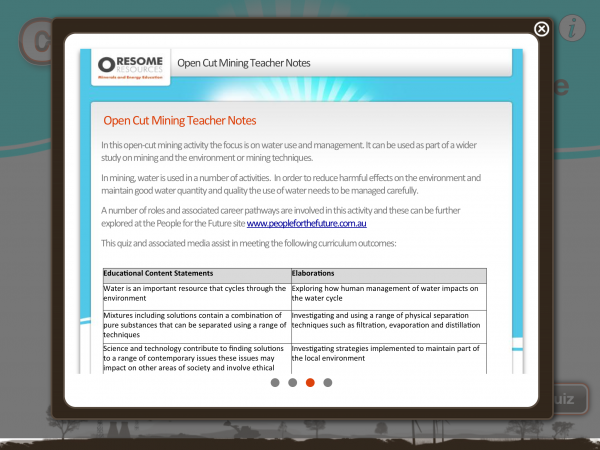 OresomeWorld also has teacher and curriculum notes so that the app can be used and tailored as an educational activity in the classroom.